I love goal setting and it is one of my favorite topics in the personal development subject. As much as I love to set goals and talk about achieving my goals, I’m aware of its disadvantages too. Yes, I have to admit that there are downsides of goal setting too. 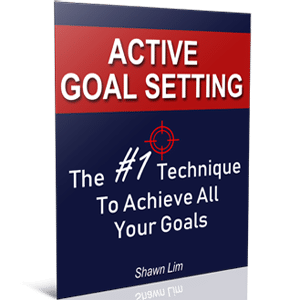 Regardless of whether you are an entrepreneur, an athlete, or someone who wants to lose weight, you have probably heard about goal setting. For the most part, goal setting is vital to your success of any target or project you want to achieve. However, that doesn’t mean that goal setting is perfect or that it doesn’t come with any disadvantages. And this is why I decided to write an article and talk about the downsides of setting goals. You have to know. Well, it doesn’t mean that you shouldn’t set goals, but you should be aware of the negative side of goal setting so that you can take the right measure to set even better goals. This is one of the most obvious and direct effects you will get from goal setting – stress and pressure. You have to understand how things work. You have a target and a deadline to hit, you somehow created stress and pressure within you. For some, the stress and pressure are good. They become the driving force that motivates them to achieve more. On the other hand, for those who don’t know how to handle the stress and pressure, setting goals make them procrastinate even more. They feel uneasy and things may crumble in their world. Hence, it depends on your own interpretation of the pressure you had on you. If you choose to treat it as a challenging force that drives you to achieve more, then great. It is eustress that helps and grows you. But if you look at the stress and pressure as something that overwhelms you, then having a goal to hit may not be ideal for you. Transform the stress and pressure into something that drives you into taking more actions rather than stopping you. You must develop your ability to handle stress and pressure. After all, a diamond is a chunk of coal that handled stress and pressure exceptionally well. Thus, grow yourself. Develop and up your own level. When you become better, the stress and pressure will become nothing. In fact, when you’re at level 9 and the stress is at level 3, it is no problem at all. You only feel stress and pressure when you have no idea how to solve it, when you feel hopeless, and you don’t know what to do. But when you do, stress and pressure will be gone. Aim to improve yourself, grow yourself, and so keep learning and develop your skills. Next, if you don’t have a goal, you won’t fail, right? But you won’t succeed too because you don’t have anything to aim for in the first place. So goal setting is a double-edged sword. 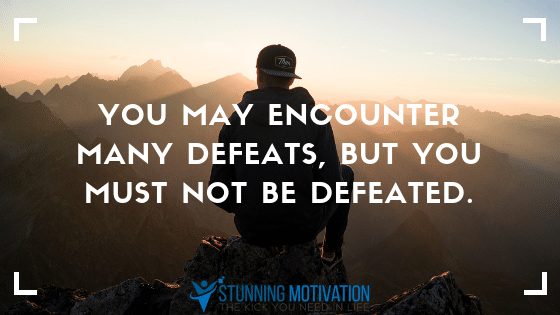 When you fail to hit your goal, it makes you feel like a failure. Worse when you compare yourself with those who set a similar goal but successfully achieve it. It will make you feel like a failure or that you’re not good enough to produce the results that you want. Think about it, if you set a goal to earn $100,000 this year and you tell everyone about it, but by the end of the year, you fail to hit your goal. How does that make you feel? Like a loser, isn’t it? First, play a game that you can win. You have to set a goal that will make you progress and improve. Hence, develop the momentum and build your confidence. You can always start small and grow bigger step-by-step. And if you want to set a stretch goal that completely takes you out of your current comfort zone, here’s what you need to do – come up with the right strategy. You have to understand how goal setting works. For incremental goals, you can achieve them through working harder. For stretch goals, you must formulate a different game plan in order to achieve them. In short, the strategy you use to earn $10,000 a month and the strategy you use to earn $1 million a month is totally different. Thus, understand what you truly want. Set a goal that will grow you rather than just wanting the result. You see, when you set a goal, you put all your energy and focus on that goal. You become less open to other opportunities and possibilities. There is a thousand way to get to your destination, but when you set the goal, you restrict yourself with just a few ways to get there. When you focus on the bull’s eye, you put all your attention there. You become less creative because all you see is the bull’s eye, and nothing else. Always be learning and open yourself up for all possibilities. While it is true that you should focus on your goal, you must also open yourself for learning and improving. Remember, there are plenty of ways you can get to your destination. You don’t just have to stick to only one route. In other words, I’m saying that when a plan doesn’t work for you, change the plan, but never the goal. If your “Plan A’ didn’t work out, try “Plan B”. Remember, there are 25 more letters. So be creative. Isn’t it good to be results-focused? No, not at all. Think about it, if my goal is to lose 10 pounds through exercise, and after a few days of hard work and I did not see any result, what do you think I will do? Highly likely, I will say that exercise doesn’t work or that I will doubt if I can lose the 10 pounds as I intended. Eventually, I will lose hope, lose my motivation, and give up. The problem is that people tend to focus too much on the goal. They only see the result rather than the progress. Things will be much different if I focus on doing the exercise for 30 minutes each day. After every workout session, I made the progress, and it makes me feel good. I feel a sense of accomplishment because I made the progress. Eventually, after a few weeks, I lose the 10 pounds that I wanted to get off. Most people tend to put too much attention on their goals that they forget that about the progress. Remember, it is your progress that will get you the result. Without making the progress, you’re not going to get the result. Like building a successful blog. You need to write and publish good content regularly. But if you focus on the goal of making money from your blog, you will give up after a couple of articles because the result you desire just doesn’t come that fast. But when you focus on making progress, you write and publish articles after articles, for months. Slowly, your blog grows and you build a group of followers. After a year or two, you see that your blog has gained some great success and people started to refer you as an influencer in your industry. Can you see the difference between focusing on the result and the progress? Having a goal is good. In fact, it is exactly what you need because it works as a lighthouse to show you the right direction. However, when it comes to your every day, you have to focus on the progress. Put your attention on the daily hustle and the daily grinding. When you make progress, you create small victories. The small wins that you created every day will accumulate and grow bigger and bigger. The more baby steps you take, the more success you will build in the long-term. Your goals allow you to see the future, but you must work on the present to get there. Your goal is to move the mountain. But you must focus on carrying away the small stones, which is your progress. Having goals that empower you to enthusiastically achieve great success is good, but it may also make you addictive to the results. It can make you ignorant to other aspects of your life, such as your health, relationships, and social. When you’re too addicted to winning, you forget your real purpose and why you set out to achieve the goal in the first place. Like when you’re arguing over something, you forget the reason why you argue in the first place, but you know you have to argue because you want to win. In other words, you win the battle, but you lose the war. Some people who are so addicted to winning that they’d willing to do something unethical just to win the game. It happens in every industry. Athletes took drugs because they want to gain an unfair advantage to win the game. Business people break the laws and do unethical things because they want to succeed. I bet you have heard it. So why do people do the unlawful and take the unethical actions? Well, simply because they become too addictive with the results. Always remind yourself of your purpose. Why do you want to achieve the goal that you set out to achieve? Why do you want to be successful? When your purpose and the reason behind your goal is clear, you will never be blinded by your goals and do something dishonest. Sometimes, you may want to also slow down and smell the roses. Take a break from time to time to calm down a little. What’s the point of chasing the wealth only to notice that at the end of the day, you don’t have the time or health to enjoy the wealth you have accumulated? Keep this in your mind – success is a journey, not a destination. The doing, the progress, what you are going through, the experience, and the journey are far more important than the result or the outcome. Therefore, put your attention on your journey. Focus on making the right progress. There are advantages and disadvantages of goal setting. And in this article, we have discussed the downsides of setting a goal and how you can overcome them. I strongly believe in goal setting. After all, we have all been wired to be goals oriented. The Reticular Activating System (RAS) in our brains help us filter off things that are unimportant to us. When you set a goal, your brain makes the goal and everything related to it as important. This is why you see a lot more of your dream car on the road after you set your intent to it. Your RAS is working and filter off the unwanted details and only show you what you want to see. My point is that we have built-in such a powerful tool in our brain. So use it to our advantage. In other words, use goal setting as a tool to grow yourself and to help you achieve what you truly want in your life. There are disadvantages of goal setting, but it doesn’t mean that you should not set a goal. You just need to be aware of the downside and make things work out in a much better way.